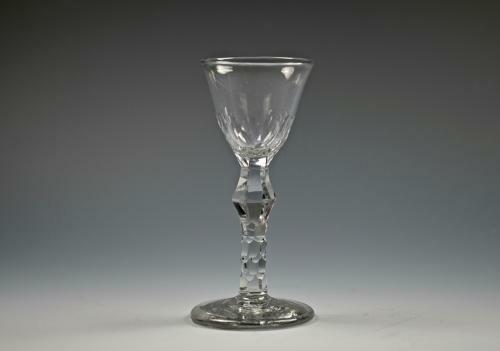 Wine glass with a round funnel bowl with basal cutting, scale or shield cut facet stem with shoulder knop and plain thick conical foot. English C1770. Condition: a few tiny nicks at the points of the facet cut knop. Note: scale or shield cut facets stems are quite rare. This is a well made quality facet wine glass.